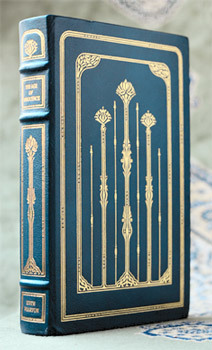 An American classic, The Age of Innocence was first published in 1920 and is set in 1870s upper-class New York. Its main character, Newland Archer, is a respectable young lawyer from a respectable family who is engaged to a respectable young woman who comes from a respectable family. These respectable people all wear nice clothes, hold dinner parties and are terribly repressed. Even so, everybody’s happy. And then Newland’s fiancee’s cousin, the Countess Olenska, arrives and throws everything off-balance by injecting a certain European-ness to New York society, and by bringing with her unthinkable scandals which really aren’t so scandalous to us living in this day and age. Predictably, Newland Archer falls in love with the Countess. I don’t want to give away any spoilers, because I love the book. It sounds horridly dull and stuffy, I know. I shouldn’t have liked the book; this is not the sort of book I normally read. After all, I find Jane Eyre boring and hate Wuthering Heights with a passion. I tried reading Austen as a teenager, found her insufferable and haven’t touched her since. Maybe I’ll try again. Nothing much really happens in The Age of Innocence, but it’s overflowing with details of New York society. I don’t believe any book I’ve read comes close to it in terms of depicting the setting, customs, relationships and ways-of-thinking of a certain group of people, with the exception of the Chinese classic A Dream of Red Mansions. Nevertheless, or perhaps because of it, The Age of Innocence is a wonderful book. Maybe it’s because it so acutely portrays the divide between the old world and the new, describing the conflicting ideals and even fashion trends between the two. Or maybe it’s because it explores the emotional turmoil everyone of us goes through when choosing between what we should do, and what we most want to do. Or maybe it’s because I watched Downton Abbey, and liked it. Martin Scorsese, an otherwise excellent film director, made a terrible version of The Age of Innocence in 1993. Despite wonderful costumes and a star-studded cast (Daniel Day-Lewis, Michelle Pfeiffer and Winona Ryder), the film is hollow and superficial compared to the book. But then, I can’t imagine anyone making a good film adaptation of a book like this, in which the characters rarely express themselves in an explicit manner. How is a movie supposed to convey, for example, that wearing a wrong dress can have disastrous effects on the social order? Anyway, here’s the trailer – enjoy!